The Jpeg makes it look waaay more saturated than a rainy day. Hello!! It looks like I'll be skipping over the Nipponbashi Street Festa cosplay post for a sec, because hanami (cherry blossom viewing) season is here! 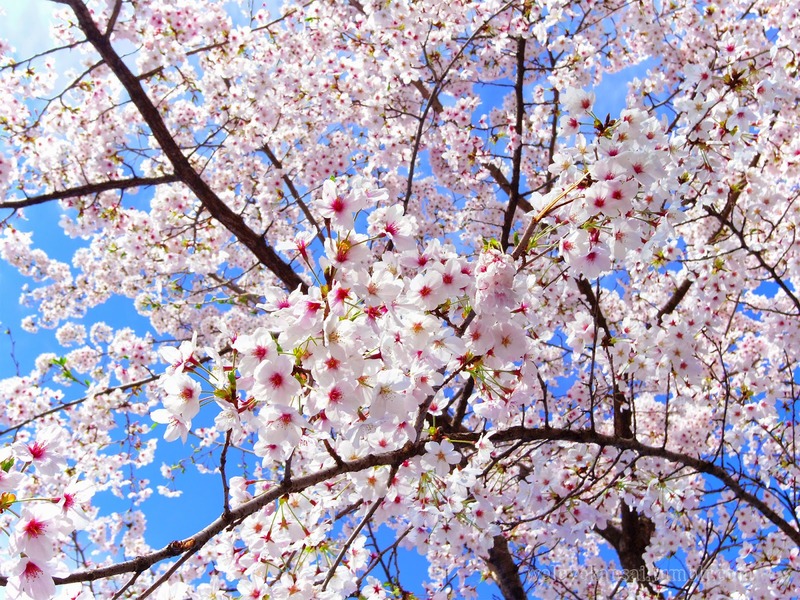 This year appears to be a fairly busy hanami season for myself, so in this post, I'll try to highlight as many hanami spots as I can that are in the Kansai area. Ratings will be based on crowds, cleanliness and closeness to convenience stores (because you can't start running out of booze in the middle of a party). 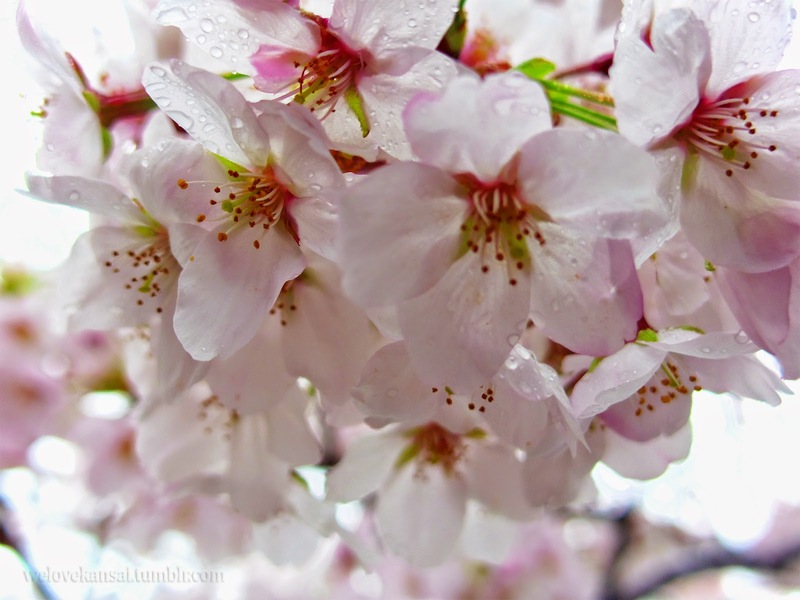 As there are a few more hanami spots left to visit, we'll call this post a W.I.P. until the end of the season (in the next couple of weeks). Utsubo Park is a pretty large park located smack in the center of Osaka City. It's Osaka's ossan Central Park? A very sad and enclosed Waterfront (D.C., for those not hip) even. But it's not all bad! There's a park, a playground for children, way too many tennis courts , and some water fountain-things. It's within walking to 3 train stations, Awaza Station, Honmachi Station and Higobashi Station, which means that, naturally, it is surrounded by convenience stores. Easily one of the best places for a spur-of-the-moment hanami adventure that requires store-bought snacks. I know what you're saying. If I like it so much, why don't I marry it? But I have a very simple response to that: People. People, in Japan and most other metropolitan areas, are not uncommon. But with Japan being the miniature version of most metropolitan areas, the people start to increase at ridiculous rates. And this sakura spot is FULL of people. Taking up shots was the only to avoid people.. It's near the municipal kindergarden, which means every child under 7 in Osaka probably plays here, and since their friends play here too, that means the moms are out in full force. It's also surrounded by 3 Elementary schools, a middle school and there's a university nearby. NOT TO MENTION the hundreds or offices located in Honmachi, as it's somewhat of a business hub in Osaka City. 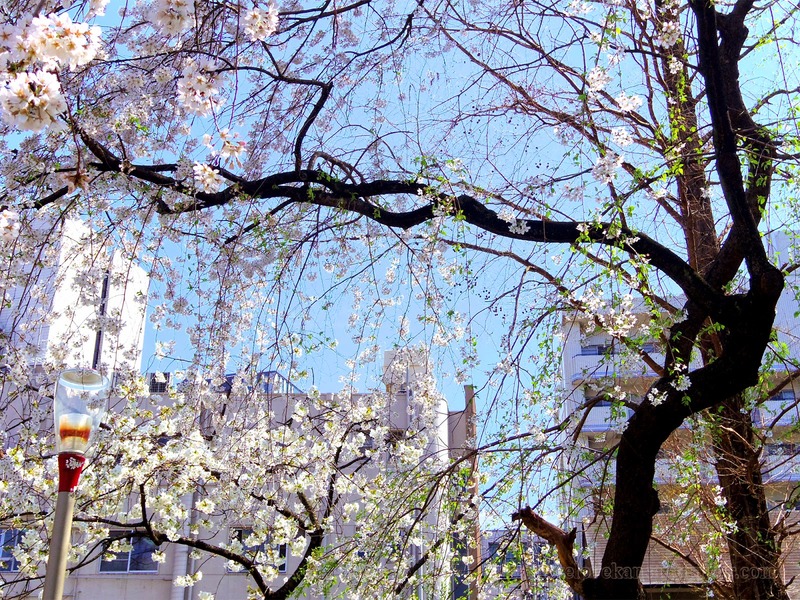 That means that any space near a sakura tree has already had dibs called for it by a blue sheet with a office's name on top. These sheets are out there the entire hanami season (about 2-3 weeks). People aren't supposed to do that, but rules in Japan are more like suggestions any way so there's that. 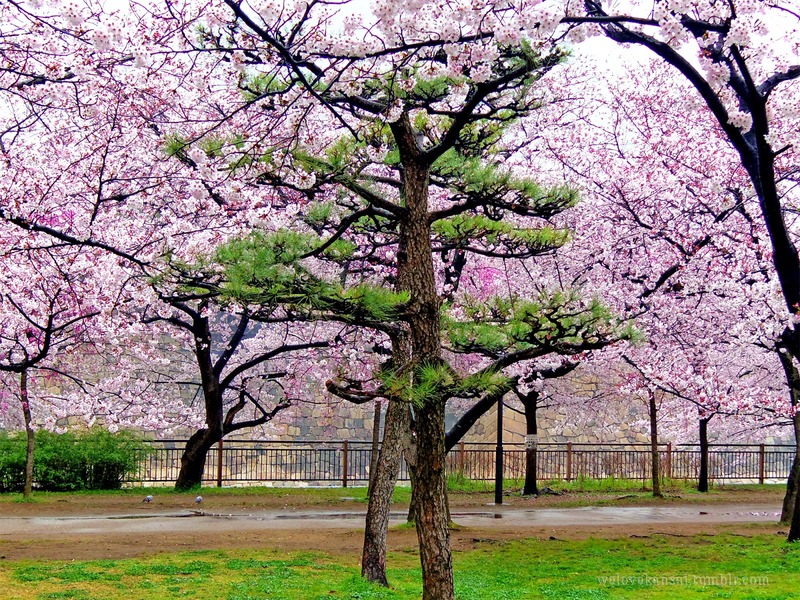 This might be my biases talking, but Osaka Castle Park is my go-to for hanami in Osaka City. I go every year, and despite the large groups of people, I always have a good time, and I think that's because of the park's biggest asset: being big. Like, Osaka Castle Park is pretty huge. Walking from one side to the other probably takes the better part of an hour, but because of it's size, you never feel like it's crowded, even when it obviously is. This size advantage lends to people have more areas to choose for their group. 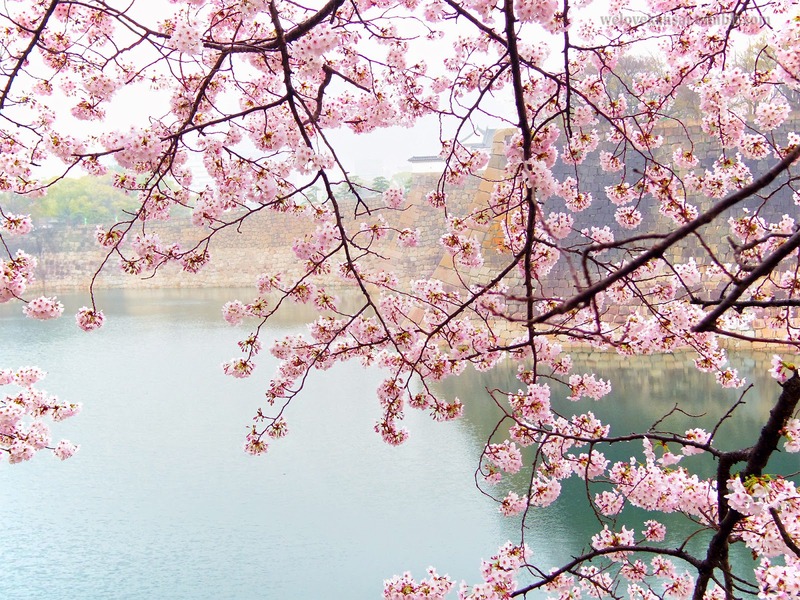 Though the biggest collection of sakura is located near the south, near the main entrance to the castle, the entire park has sakura lining the moat, so you're almost guaranteed a spot. Unless it's the weekend. There are no guarantees on the weekend, but you'll be better off at this park than, say, Utsubo. I would say that some of the negatives are the trash. People seem to be pretty terrible at cleaning up after themselves sometimes. Also, even though BBQ's are not allowed in the park, I've seen people BBQ'ing (again, Japan and rules being suggestions), and have found seating areas covered in spent charcoals. THAT was not done by non-Japanese, for sure. Only other Japanese would have the balls blatantly disregard huge signs written in their language (the "No running onto trains" is another blatantly ignored one) and try to ruin public property in the process. Another somewhat negative is the distance to convenience stores. You're sure to find a few near the train exits around the park, but once you enter the park, especially the area inside the moat, you're at the mercy of the food stalls within. That food is probably no more expensive than what you find at festivals, but probably more than you'd like to spend. But the solution to that is easy, just buy a crap-ton of food and drink, then go inside and have the time of your hanami! Also, you can enjoy nighttime hanami in Osaka as it doesn't close (neither does Utsubo, but again, office people)! Nighttime is a great alternative for those that want to avoid big crowds of children during the day. That's all I got for now, but sakura just started blooming literally this week, so there's still time for more! As always, questions and comments welcome! And if you're looking for help or suggestions about the kansai area, don't be afraid to ask!